Of the five attachments on my pasta extruder, the only one I hadn’t used was the bucatini one. So, on a cold, windy night, what better than to pair a nice freshly-made bucatini with a traditional, slightly spicy amatriciana sauce? Heat the bacon and pancetta in a heavy saute pan over medium high heat, until most of the fan has been rendered. Remove the bacon and pancetta pieces from the pan, leaving just enough fat to cover the onions and garlic. Along with the red pepper flakes and some freshly-ground black pepper, heat the onions and garlic until lightly browned, and then add back the bacon and pancetta, along with the carrot. Add the can of tomatoes, cherry tomatoes and some fresh thyme and simmer over lower heat for about 10 minutes. Meanwhile, cook the bucataini. To thicken the pasta sauce, add some of the reserved pasta water to the sauce. Serve over bucataini, and top with fresh parsley and Pecorino-Romano cheese. Add salt and pepper to taste. -Friday, February 10, 2012: Added a pound of ground beef to go with the bacon and pancetta, and cooked it all with some beer. Also, used small grape tomatoes cut in half, along with tomato paste, instead of canned diced tomatoes. 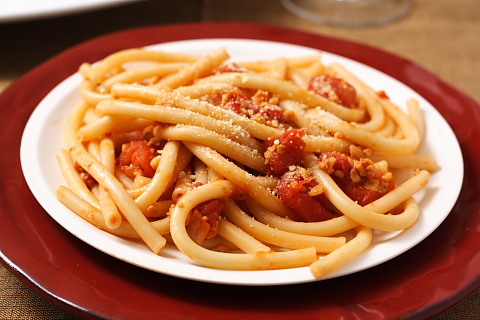 This entry was posted in Italian, Main Dish, Recipes and tagged Amatriciana, Bacon, Bucatini, Fresh Pasta, pancetta. Bookmark the permalink. Your pasta looks beautiful and Amatriciana is one of my favorite sauces. I actually borrowed the picture from elsewhere (working on getting a better camera! ).